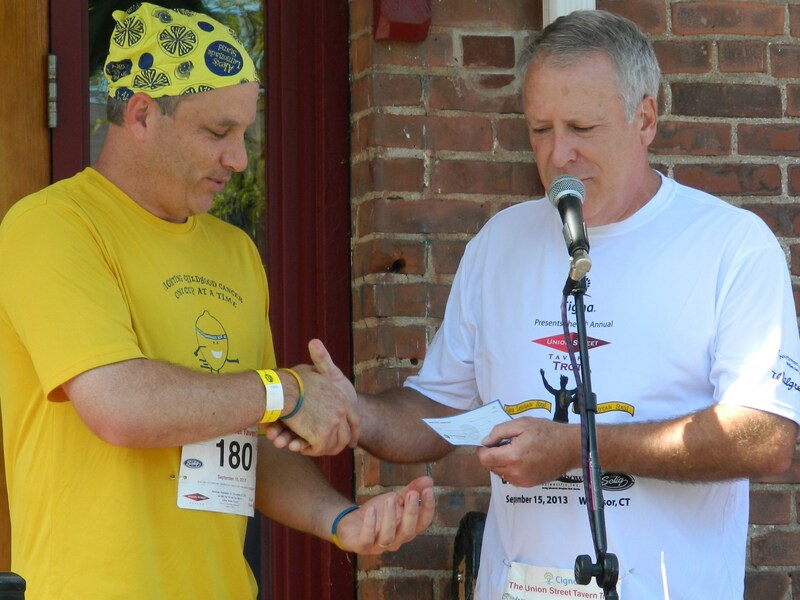 Jason “Jay” Scott accepts a ceremonial check from Mike Deneen, part owner of Union Street Tavern during the 7th Annual Tavern Trot in Windsor, CT.
7th annual Tavern Trot gets underway. 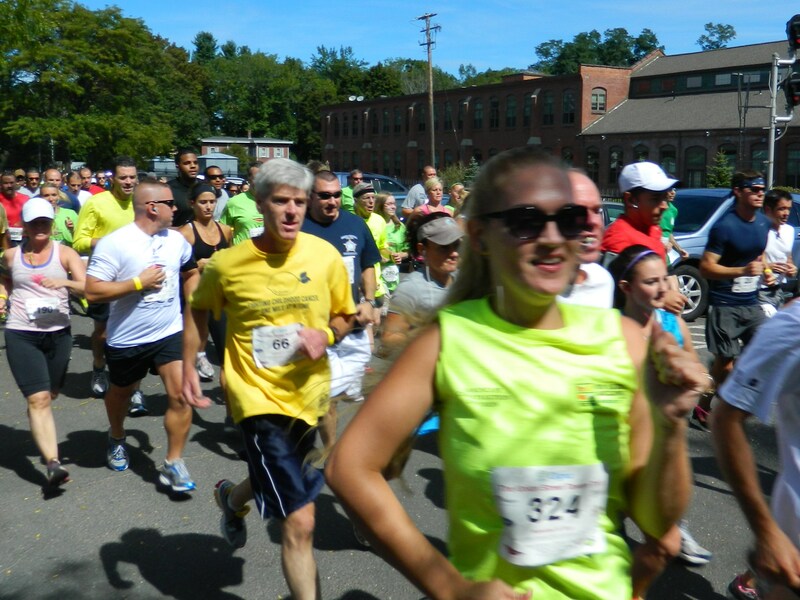 In its seventh year the Tavern Trot has reached a milestone now having raised more than $100,000 for pediatric cancer research. 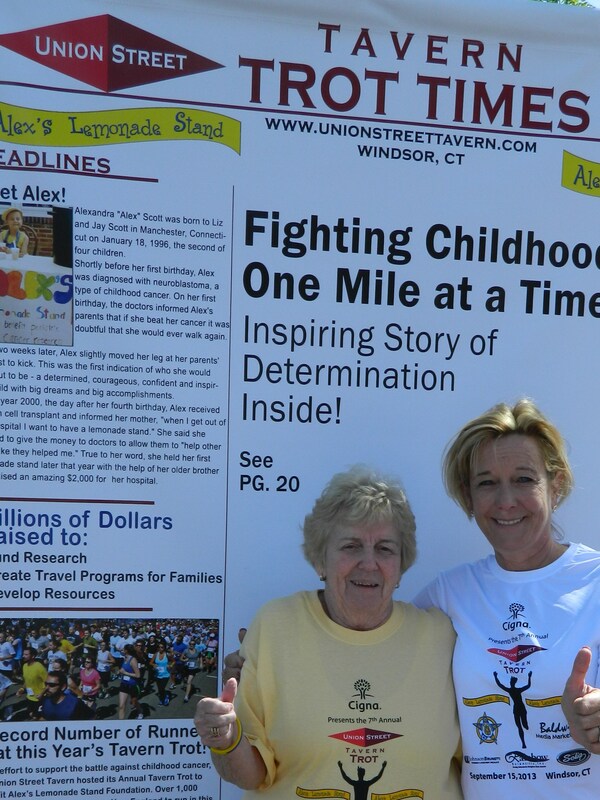 Hosted by the Union Street Tavern in historic Windsor, Connecticut on Sunday, September 15, the 3.5 mile trail and road race benefited Alex’s Lemonade Stand Foundation. A special participant was the grandfather of the little girl who started the foundation – he took part just two months after receiving a lung transplant. “This $100,000 is enough to pay for a year of a research project,” said Jason “Jay” Scott, the father of little Alexandra “Alex” Scott who started Alex’s Lemonade Stand outside her Connecticut home to help other children fighting the disease before she lost her own battle to Neuroblastoma in 2004 at age 8. Millennium Magic singing the national anthem. Scott relayed the story of an experimental project funded by donations, whereby a child’s terminal brain tumor was injected with polio then treated with a polio vaccine that triggered an attack on the polio which in turn killed the tumor – and he said the treatment was done without the side effects of other types of treatments. Thus Scott noted events such as the Tavern Trot are giving not only help, but hope, to the millions of afflicted children and their families. 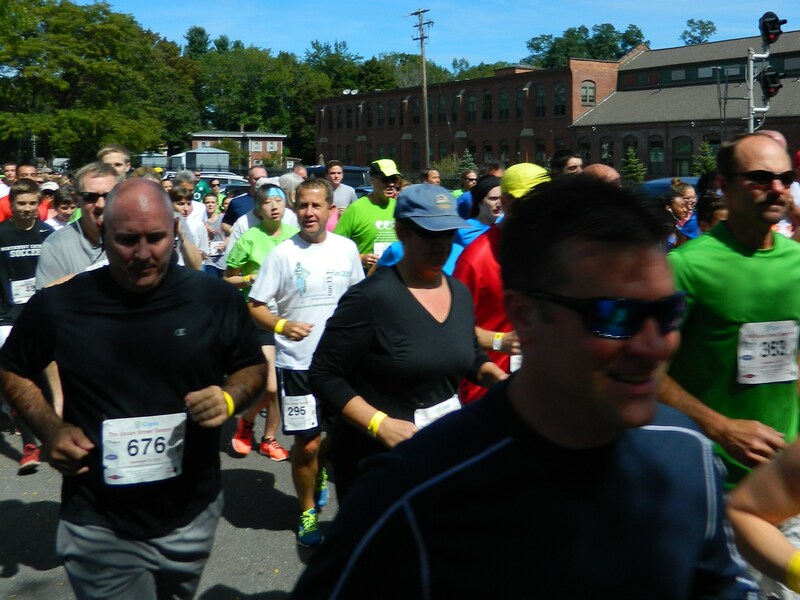 Graced with sunny, clear skies and temperatures in the high 60 degree range – heralding the approach of autumn – the annual race has grown from its humble beginnings of 300 runners to attracting more than 700 this year. 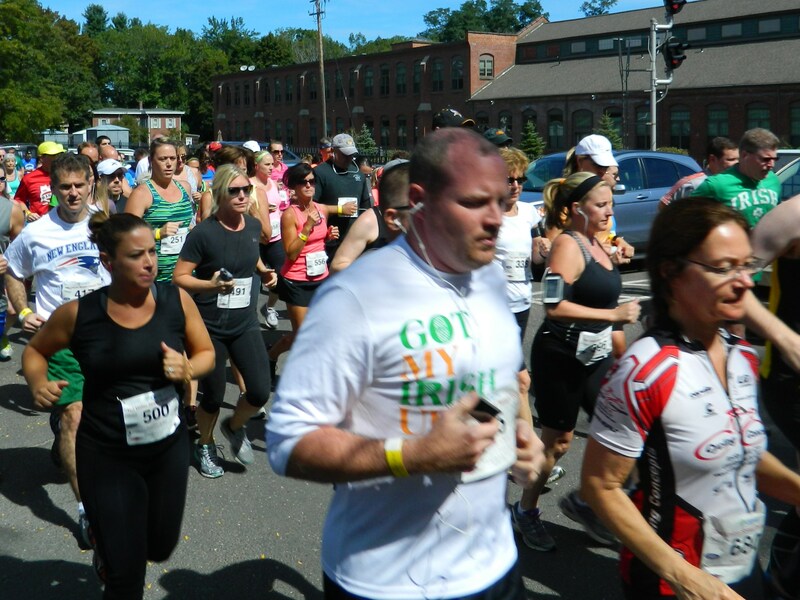 “This is our 7th year in a row of perfect weather,” said Mike Deneen, part owner of the Union Street Tavern who also ran the course. For the third year, sportscaster Joe D’Ambrosio ” the Voice of the UConn Huskies” served as master of ceremonies. 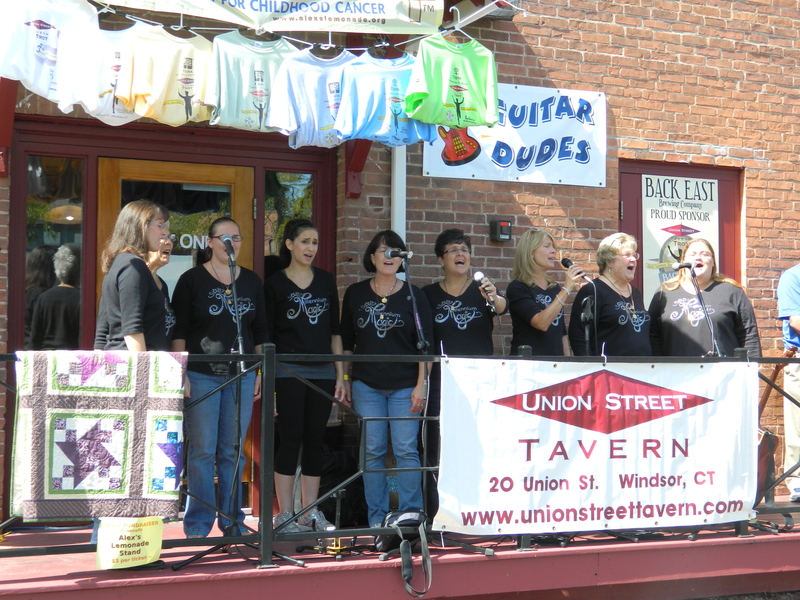 Before the 12: 30 p.m. start of the race, Millennium Magic, a division of the Sweet Adelines, sang the national anthem. Deneen presented a ceremonial check to Jay Scott, citing a projection that this year’s race would raise more than $25,000 tipping the total raised over the seven years beyond the $100,000 mark. Scott, who ran in the race came up from Pennsylvania where his family currently resides. However, he spoke of his and his wife’s roots being in Windsor where they each grew up and still have relatives who live in town. Pat Scott and Ann Walsh. In fact, Jay Scott’s father, Alex Scott’s grandfather Pat Scott of Windsor, was set to walk the course just two months after receiving a lung transplant. “I get choked up,” said Pat Scott, referring to the strong connection between the race and his granddaughter – remembered too for the determination she displayed while fighting her cancer. Diagnosed with Pulmonary Fibrosis a few years ago, for which he said there is no cure, Pat Scott underwent conditioning at St. Francis Hospital and Medical Center in Connecticut in preparation to receive the lung transplant which was done at the University of Pennsylvania Hospital. That location enabled Pat Scott to recuperate at his son’s nearby home. Because his circumstances became so grave he was made a priority for a transplant and said he was on the transplant list for only 12 days before getting the call. “I’m so grateful. I owe a lot to my friends and family for the support they gave me,” he said. Scott credits the presurgery conditioning at St. Francis for making a tremendous difference in his ability to bouce back quickly. “I feel like a new person,” he said. The day was a backdrop for an emotional reunion between longtime friends Pat Scott and Ann Walsh of Windsor. A volunteer for Alex’s Lemonade Stand since the beginning, Walsh recently lost her beloved husband Bill who was also devoted to the cause. 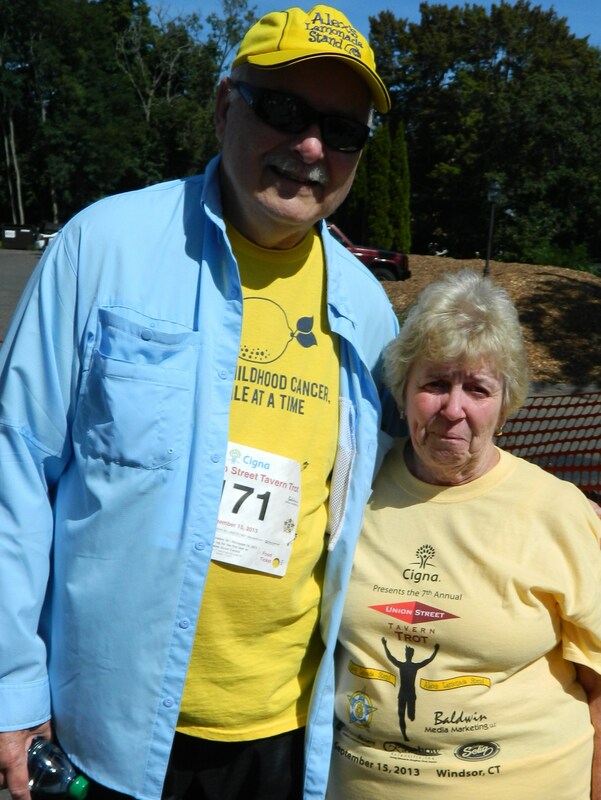 It was only a year ago that Ann, and Bill who was fighting a brain tumor at the time, attended the Lemon Aid Golf Tournament together to benefit Alex’s Lemonade Stand. Quilt made by Kathy Wakefield and Diane Mullin, teachers at Oliver Ellsworth School. Ann Walsh shared the story of yet another moving moment of the day. Windsor resident Dan Nolan, Deputy Chief of the Hartford Fire Department and army veteran of the wars in Iraq and Afghanistan, ran in the Tavern Trot and won a quilt raffled off at the event. Active in charitable endeavors, when Nolan learned that an Avon woman whose daughter had died in a car accident had hoped to win the quilt in her memory, he generously gave it to her. 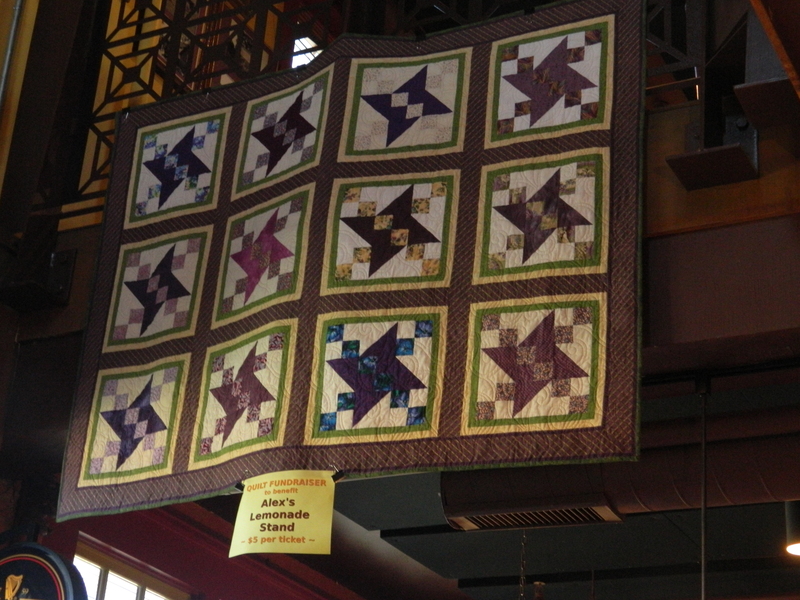 The quilt is the sixth one to benefit Alex’s Lemondae Stand made by Kathy Wakefield and Diane Mullin, teachers at Windsor’s Oliver Ellsworth School. 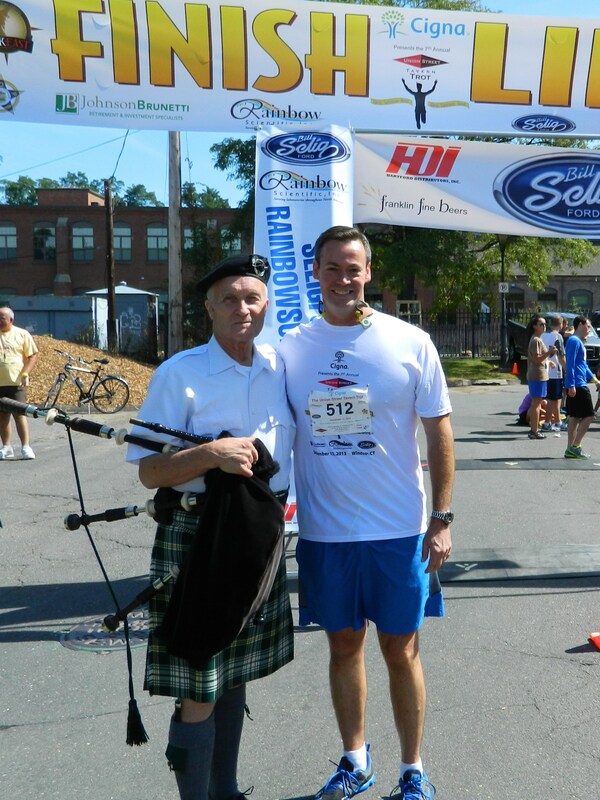 Bagpiper Pat Whelan with Dan Nolan. Turning out to play the bagpipes for the event was Pat Whelan. Originally from Dublin, Ireland, Whelan immigrated to United States in 1960. He serves as the Pipe Major for the Connecticut State Police Pipes & Drums and the Glastonbury-based St. Patrick’s Pipe Band, and, was praised by Nolan as being the best at what he does. “Pat is the best. He plays at all the Irish funerals and many, many events in the area,” said Nolan. “It’s for a good cause, that’s all it takes,” said Whelan. Alex’s Lemonde Stand volunter Ann Walsh, and Ann Baldwin of Baldwin Media Marketing, LLC. New this year was a Tavern Trot Times poster that people could stand in front of to promote the importance of pediatric cancer research. Drawing a great deal of attention, the poster was the brainchild of Ann Baldwin, head of Baldwin Media Marketing , LLC, a key Tavern Trot sponsor. Visit alexslemonadestand.org for more information about pediatric cancer research and the non-profit foundation. Jackie thanks do your great coverage of this event ! Well written and the phots really help tell the story! You are a true journalist at its best.